CQ CQ CQ – #HamRadio Saturday – POWER! That is to say, the folks who made my Juicebox finally got the new batteries to me. You may recall that my hardened portable power unit wouldn’t charge, despite my various efforts. So, the Juicebox folks wrote to say they were going to send new batteries. Then, days later, I got the email with the shipping information: no movement of the package, even though it was 2nd day shipping. I dropped them a line and they started the process over. New batteries arrived. I pull the guts of the unit out of its ammo can case. I swapped out the batteries and – bada bing! It works. I tried to charge the removed batteries with my 12 v 6 amp trickle charger for a couple days each but – no joy. The multimeter suggests that these batteries have gone to the Voltaic Pile Happy Hunting Ground. The effect of this battery switching operation is that I have now a way to plug in the Kenwood T140S which WB0YLE sent and which came with an Anderson Power Pole cord! Since the Juicebox has, among others, these Anderson Power Pole connectors, I’m in business. I can now take the unit out on the road, if I wish. Heck… now I can actually power it up! I set up the rig on the balcony of the building with a Buddistick antenna (I thirst for their Buddipole, the versatile dipole). The location isn’t ideal, since the balcony has a lot of limestone around it, and tuning the antenna is a little tricky (at least for me). Still, the elevation is excellent. The building is on one of the highest spots in the city. I could probably string some wires to the nearby trees… hmmm. I am gaining practical knowledge now, not just theoretical, about the importance of antennas. So far, I’m doing a lot of measuring with a tape measure. So, yesterday I fired up the transceiver and scooted around listening on the 20m band. I heard quite a few CW contacts (Morse code) going on. My Morse Code is really bad at this point, though I am practicing. The code was flowing pretty quickly. I switched on my iPhone Morse decoder app and, when I got the tone adjusted so that the app had a shot at deciphering it, I read some clear texts. I heard one fellow in Maine make a QSO (contact) with another fellow. I wrote down what I heard and looked him up so I could at least send an email. He responded right away with a friendly and supportive note. NB: So far, the hams I’ve met have been really nice people! They are friendly and helpful. So, I figure it is time for me to develop a QSO card. I also have to pull out some of the old UStream Z-Chat hardware and find that adapter plug for my headphones. Some of that Morse is a little weak and covered by static. With CW, I am not yet in an active mode of sending out CQs (requests for contacts). My Morse code isn’t there yet and – even more fundamentally – I don’t have even a basic key! I have looked into a couple rigs which also decipher Morse and PSK31. There’s a spiffy Yaesu in the FTDX series that looks useful. I also saw a super versatile and portable Elecraft KX3, which can decode. It has a keyer that you can attach directly to the side. There is a bewildering choice among keying hardware and, therefore, methods. Anyway… that’s what wishlists are for, I guess. I will need a couple different styles of keys so I can figure out what I want to use the most. For the time being, however, the old fashioned key seems to be the best option. Meanwhile, my brain works and I am learning. On the little hand held Baofeng front, I received a USB cable and got the Chirp program set up. The computer talks with one of the radios but not the other. I have more than one of these inexpensive, low-power radios for work on the local repeater. Yesterday I attached a mag antenna to one and spoke to a couple guys while I was running errands. One nice fellow, Catholic and Knight of Columbus, was on his way to visit his 2.5 lbs daughter in a local hospital’s NICU. In the meantime, I will turn on my Echolink program for a while today while at my computer. It’s homily prep continuation today (Novus Ordo on Sunday! That’s a change of pace.) If you are a ham, you can use Echolink. Install the program and send your call sign in for a password. Easy. There must be more of you! This entry was posted in Ham Radio and tagged antenna, Buddistick, Echolink, Juicebox, Kenwood, Morse Code, The Phantom. Bookmark the permalink. 30 Responses to CQ CQ CQ – #HamRadio Saturday – POWER! Post something when you’re going to be on the air and I can try to be on at the same time. I use 10m a lot when its open, but I can go anywhere from 40m to 10m on the AlexLoop. I also have a home brewed 6m antenna I can try, but I’ve never had much luck with 6. I have two CW keys — one is a Russian army, European style “postal” straight key which sits up high and on table edge — the hand and arm never touch the table so forearm does most of the work, not the wrist, so less change of “glass arm” (a.k.a. carpal tunnel or very achy wrist) — the other is a Czech straight key similar to the classic American style of straight key which sits back on table but I’ve used it on edge as well — both very smooth acting and have built-in dust covers. Both came from e-Bay, less than $40 each. I never could get the hang of iambic keys or bugs. Best thing with Morse is to hear it as sound only, do not “count” characters — you hear “di-dah” and “A” immediately comes to mind — no mental “lessee, dot – dash — that’s “A”” You’ll fall behind fast. Thankfully, they have good training software out there. I even have software to practice sending so I can get the timing right. Very enjoyable. Often I can only hear CW or digital modes. Some of the “sound card” devices like the ones that do PSK-31 and RTTY can send “audio Morse” using SSB. Not real Morse in the sense of being just a carrier on-and-off with radio supplying side tone so you can hear it, but somebody listening probably wouldn’t know the difference. Only problem can by trying to mechanically decode a poor fist or when QRM/QRN/QSB is a factor — then sometimes only a good ear can make it out. You can add me to your priestly HAM list. I have also long been interested in amateur astronomy. Great! 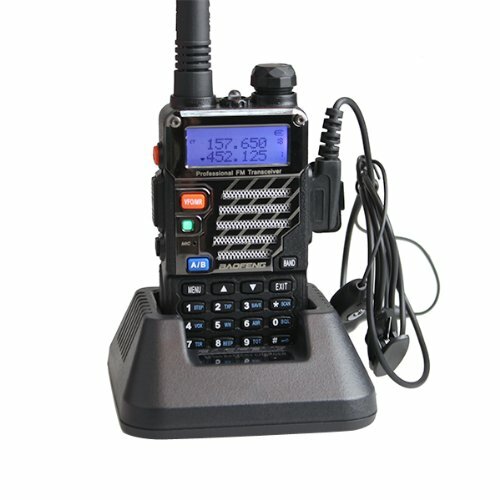 Find the local repeaters and get that Baofeng set up! I’ve logged into the Echo Link node set up for the “WDTPRS Cafe” but no one is ever on…0/20. I’ll keep trying…perhaps a sked? Just curious, but are any of you other hams here SOTA chasers? Perhaps have a registration field for the website “Call Sign (HAM Radio):” to assemble a list, or ask that we use the personal details section. What is your local repeater there? Perhaps it also has an Echo Link node. I also have a small Baofeng (the UV-B5), and they’re great for getting onto a local 2m repeater. Figuring out the correct tones and offsets can be a bit daunting. Working amateur radio is nothing like using walki-talkies. MWindsor – by SOTA are you referring to Summits on the Air? I was unfamiliar with it until I was walking up the trail to Clingman’s Dome back in early May and a guys was sitting there with a dipole working 20m. He called CQ over his radio and I hollered to him, KJ4MPE returning. He looked up and we had a brief eyeball QSO. Father Z: you can work PSK31 using a computer program and your microphone, if you’re on HF. I’ve had good luck on 15m, 20m, and 40m just pointing my microphone at my computer speaker, putting the transceiver in VOX mode. My computer’s mic picks up the noise coming through my transceiver’s speakers and spits out the text on screen for me. Works great. Been studying and will take the Technician exam next Monday evening 8/3. I am also going to go for the General as eventually I want to get into HF but first things first, get a VHF/UHF station up and running and talk to the local repeater. Fr. Z – a straight key will be coming your way. I have spares. I’ve held my iPhone with the PSK31 app near my computer speaker to decipher examples of PSK. They were pretty clean examples, of course. I’m a longtime Z-Blog lurker. My call sign is AF7KQ. Not a Ham Radio devotee but I loved the Ghost Who Walks when I was a kid. Thanks for putting that up. @Chris1 – Yes, Summits On The Air. I was thinking that it might be fun to get a SOTA network running one day based on WDTPRS hams. ALL: You folks can start without me, you know. Use the combox under these CQ posts to set up your scheds. This is going to sound a bit purist, but don’t take it that way too much. I am just making a mental sigh. I just looked, again, at the Technician license exam requirements. Apparently, one needs only to memorize the answers – the questions and answers are already given. I think this is great for getting people in to the hobby, but it doesn’t really teach them much about radio science. I want to scream out, “cut-off frequency,” which , of course, gives answer D, since the higher the frequency, the closer it is to the cut-off frequency and the less power radiated through the cable. We use the same equations (including transmission line theory) to describe musical instruments. Does that mean that people answering that question have any idea about cut-off frequencies (it can be spelled either cutoff or cut-off) in transmission lines or waveguides or are they just giving an answer? That is what I mean about understanding the science. Even if I passed the Technician exam, I, really, wouldn’t understand that much more about radio science (although I would know more about the regulations). My father held the Amateur Advanced Extra class license, back when they had the six classes, which required an extensive exam and Morse Code of at least 20 wpm (he maintained the radio communication system for the largest railroad systems in the country). I had some of his old ARRL test study books and the material was a serious presentation of radio science. You had to be able to draw and analyze tube circuits (back in the day before semi-conductor and chip technology tool over). That is the level of knowledge I want. Alas, I am not an electrical engineer nor do I have expertise in radio communication. Short of apprenticing or taking technical courses, I have no idea how to get that information. I can do more math than would ever be required of any but the most advanced analysis of the most non-linear tube or semi-conductor circuits (since a lot of neuroscience requires these, as well as other theoretical areas I do work in), but that still doesn’t mean that I understand radio science. I am not an elitist – I want people to enjoy the hobby at all levels, but for me, passing the Technician exam or even the General class exam as they are currently written, doesn’t give me the level of understanding I really need. I want to be able to understand why things work, not just use a black box. Does that make sense to anyone? For me, radio is a science, not just a hobby and it makes it difficult for me to approach it without a great deal of respect. We have someone in the department who is a Ham and I could, in theory, take the exam whenever it was practical, but then what? I would have a license, but would I, really, be a Ham? I know most people would say, yes, but I’m Old School and I really want to learn the art of the radio. That makes one, in my opinion, a real Ham. As I say, I’m a bit old school, but looking at those old schematics in the the ARRL Handbooks was like looking at something really mysterious and reserved for those who could know. I miss those old days. It is something that society is missing in general – a respect for mystery and transcendence. You can find hint of something beyond yourself in the strangest places – even something like a circuit diagram can give praise to God, after all. Chicken: That’s why there are more hams out there now than there were in bygone days. But you can do with the program whatever you want. It’s like a college degree. You get the degree, but does that make you a subject-matter expert? No. You continue if you want to become more of an expert. And I freely admit that I memorized parts of the exam. There are just some aspects of the testing that don’t interest me at all. I hope never to build a radio of my own and PSK31 and RTTY really don’t do much for me (I’ve played with both PSK31 and RTTY a bit, but it’s not something that I’ll do much of). But I did take wave propagation and antenna design beyond what the exams required…because those are the things that I find interesting. The mystery and transcendence are still there. (Look up VK3YE on YouTube. He does some cool stuff from the ground up.) But the mystery and transcendence are no longer part of the exam process. That’s all that’s really changed. It’s gotten guys like me into the hobby that saw too much mystery as off-putting….but there are plenty of mysteries still out there. All you need is a Call and Echolink registration. Many thanks to Bryan Boyle for the effort and know-how. I suggest that one approach could be for anyone so inclined could just logon at 9pm every night, and then we could settle on a day that works for everyone for perhaps a weekly net. I will barring illness log in tonight at 9PM EDT. FYI – the W9YT repeater in Madison (and therefore a possible 2m hangout for Fr. Z on his HT) is normally an Echlink node as well, and I have surfed onto it a few times, but the Echolink part appears to be down. It’s available 24×7…well, depending on how reliable my ISP is…and it’s pretty good…and the computer, ISP modem, router and firewall, as well as the hosting computer are on a UPS, so, unless it’s TEOTWAWKI, it should be ok.
Just FYI, it is connected to an RF transciever during morning drivetime (USA ET, 0630-0830), so, just be aware that during those times M-F, you will be on a local set of repeaters out here. You are exactly the type of person we would welcome with open arms. I remember when I passed my 1st Phone back in the day when you needed it (or it marked you as seriously interested in a career in broadcasting…), the FCC inspector at the Varick St. federal office in NYC said that I had earned the license to learn, not just passed a test. Never forgot it. Good luck. You’ll be fine, and walk out of there with a pass slip. I enjoy sitting as VE and watching the grins when you are able to say ‘Congrats’ and shake the hand of a newly minted ham (or an upgrade candidate). Premature, but, welcome aboard! And…no response or logins at 9pm EDT as suggested. I will continue to login every evening at 9pm EDT as often as possible. If we get a group together we can decide on perhaps a weekly net day and time. Ha! And no sooner do I type the above then does Bryan Boyle come on line for a very pleasant QSO. Thank you sir. Bryan indicated we were all free to login anytime and I indicated a willingness to try to login at 9pm daily to see when we could get a regular thing going. Mr. Boyle is an exceedingly kind gentleman for doing this for us. Let’s make use of it. Who knows? Our little group could become helpful to our priests, should the worst occur. (Pace Card. George, RIP). Ok. So who’s up for Saturday at 12:00noon central time/1700z. I can make the run up into Oklahoma and do a SOTA activation (W5U/OU-005 for anyone that chases, and maybe W5U/OU-002 if the timing works out). I think Fr. Z can even get points for SWL (Short Wave Listening), but I’m not sure. And this is a pretty solid test for TEOTWAWKI. A guy with a battery pack and a radio stuffed into a backpack goes up a hill to transmit to anyone that can hear. It’s a good way to pass news/traffic when nothing else is working. It’s a good way to test my gear too. But its a three hour drive each way. If there are at least 4 people willing to give it a shot, I’ll make the drive. I was planning on it one of these weekends, so it might as well be this one. But I’ve done it when I only made 2 contacts because of conditions, so I’d like to make sure there’s a bit bigger audience if I can. And you folks in Europe and South America – this is potentially for you too. I’ve talked to Europe and Patagonia on treks like this. It’s not so easy, but if 10m is open then anything is possible. I will have to get Echolink up and running on my tablet and check in one evening. This week looks bad – I have to complete four online FEMA courses this week in order to qualify for registration for a county RACES symposium in October – and Thursday evening I will be attending the wake of an SK who passed on Saturday – most unexpectedly. Still in shock about losing Bob Conroy, KB2VGM. Fr, Z, if you would be so kind as to remember him in your prayers …….. he was a good man and a good Ham. Nothing, really. I just miss the old days, a bit. I suppose the difference between the Ham tests of today and those of the days-of-yore is sort of like web design. With a decent software package, one can make really nice web sites and use them to communicate with many people. That thought never occurred to me. I had to learn to write the code from scratch. The end result is the same, but I suppose the scientist and musician in me wants to take things apart and see the tiny pieces. I think the FCC, rightly, came to the conclusion that the nuts-and-bolts of building transmitters and receivers, especially with chip technology, has become impossible even for dedicated Hams to deal with because a lot of the technology is proprietary.